Is 2nd Marriage During Pendency of Appeal Against Divorce Legal? By a judgment dated 31.08.2009, the Additional District Judge, North, Tis Hazari Court, Delhi allowed the petition filed by Ms. Rachna Aggarwal Under Section 13(1)(i)(a) of the Hindu Marriage Act, 1955 (hereinafter referred to as "the Act) and dissolved the marriage between her and the Appellant. By the said judgment the petition filed Under Section 9 of the Act by the Appellant for restitution of conjugal rights was dismissed. The Appellant filed appeals against the said judgment and the operation of the judgment and decree dated 31.08.2009 was stayed by the High Court on 20.11.2009. During the pendency of the Appeal, the Appellant and Ms. Rachna Aggarwal reached a settlement before the Mediation Centre, Tis Hazari Court, Delhi. 2. As a pure question of law arises for our consideration in this case, we make it clear that we are not dealing with the merits of the allegations made by both sides. a) Whether the dismissal of the appeal relates back to the date of filing of the application for withdrawal? b) Whether the marriage dated 06.12.2011 between the Appellant and the Respondent during the pendency of the appeal against the decree of divorce is void? 3. The Family Court framed only one substantial issue as to whether the marriage between the parties was null and void on account of the contravention of Section 5 (i) of the Act. It was held by the Family Court that the judgment and decree of divorce dated 31.08.2009 is a judgment in rem which was neither reversed nor set aside by a superior court. 15. Divorced persons. When may marry again.-When a marriage has been dissolved by a decree of divorce and either there is no right of appeal against the decree or, if there is such a right of appeal, the time for appealing has expired without an appeal having been presented, or an appeal has been presented but has been dismissed, it shall be lawful for either party to the marriage to marry again. 6. It is pertinent to take note of the Proviso to Section 15 of the Act according to which it shall not be lawful for the respective parties to marry again unless at the time of such marriage at least one year has elapsed from the date of the decree in the Court of first instance. 10. Undoubtedly the proviso opens with a prohibition that: "It shall not be lawful" etc. Is it an absolute prohibition violation of which would render the act a nullity? A person whose marriage is dissolved by a decree of divorce suffers an incapacity for a period of one year for contracting second marriage. For such a person it shall not be lawful to contract a second marriage within a period of one year from the date of the decree of the Court of first instance. 8. After a comprehensive review of the scheme of the Act and the legislative intent, this Court in Lila Gupta (supra) held that a marriage in contravention of the proviso to Section 15 is not void. Referring to Sections 5 and 11 of the Act, this Court found that a marriage contracted in breach of only some of the conditions renders the marriage void. This Court was also conscious of the absence of any penalty prescribed for contravention of the proviso to Section 15 of the Act. 9. The majority judgment was concerned only with the interpretation of proviso to Section 15 of the Act. Justice Pathak in his concurring judgment referred to Section 15, but refrained from expressing any opinion on its interpretation. 10. In case of a dissolution of marriage, a second marriage shall be lawful only after dismissal of the appeal. Admittedly, the marriage between the Appellant and the Respondent was on 06.12.2011 i.e. before the order of withdrawal was passed by the Court on 20.12.2011. (b) a Plaintiff may, in the circumstances mentioned in Sub-rule (3), be permitted by the court to withdraw from a suit with liberty to sue afresh on the same cause of action. Such liberty being granted by the Court enables the Plaintiff to avoid the bar in Order II Rule 2 and Section 11 Code of Civil Procedure. 12. Order XXIII Rule 1(1) of the Code of Civil Procedure gives an absolute right to the Plaintiff to withdraw his suit or abandon any part of his claim. There is no doubt that Order XXIII Rule 1 of the Code of Civil Procedure is applicable to appeals as well and the Appellant has the right to withdraw his appeal unconditionally and if he makes such an application to the Court, it has to grant it.4 Therefore, the appeal is deemed to have been withdrawn on 28.11.2011 i.e. the date of the filing of the application for withdrawal. On 06.12.2011 which is the date of the marriage between the Appellant and the Respondent, Ms. Rachna Aggarwal cannot be considered as a living spouse. Hence, Section 5 (i) is not attracted and the marriage between the Appellant and the Respondent cannot be declared as void. The meaning that the Court ultimately attaches to the statutory words will frequently be that which it believes members of the legislature attached to them, or the meaning which they would have attached to the words had the situation before the Court been present to their minds. Interpretation is the process by which the Court determines the meaning of a statutory provision for the purpose of applying it to the situation before it. 33. We may also emphasise that the statutory interpretation of a provision is never static but is always dynamic. Though the literal Rule of interpretation, till some time ago, was treated as the "golden rule", it is now the doctrine of purposive interpretation which is predominant, particularly in those cases where literal interpretation may not serve the purpose or may lead to absurdity. If it brings about an end which is at variance with the purpose of statute, that cannot be countenanced. Not only legal process thinkers such as Hart and Sacks rejected intentionalism as a grand strategy for statutory interpretation, and in its place they offered purposivism, this principle is now widely applied by the courts not only in this country but in many other legal systems as well. In a Court of Law or Equity, what the legislature intended to be done or not to be done can only be legitimately ascertained from that which it has chosen to enact, either in express words or by reasonable and necessary implication. 19. Aggrieved by the decree of divorce, the Appellant filed an appeal and obtained a stay of the decree. During the pendency of the appeal, there was a settlement between him and his former spouse. After entering into a settlement, he did not intend to contest the decree of divorce. His intention was made clear by filing of the application for withdrawal. It cannot be said that he has to wait till a formal order is passed in the appeal, or otherwise his marriage dated 06.12.2011 shall be unlawful.Following the principles of purposive construction, we are of the opinion that the restriction placed on a second marriage in Section 15 of the Act till the dismissal of an appeal would not apply to a case where parties have settled and decided not to pursue the appeal. 22. I am in agreement with the view taken by Nageswara Rao J. but it is necessary to state how the question before us has already been settled by the decision in Lila Gupta v. Laxmi Narain and Ors. MANU/SC/0515/1978 : (1978) 3 SCC 258. Even when the words of the proviso were found to be prohibitory in clear negative terms - "it shall not be lawful" etc., this Court held that the incapacity to marry imposed by the proviso did not lead to an inference of nullity, vide para 9 of Lila Gupta (supra). It is all the more difficult to infer nullity when there is no prohibition; where there are no negative words but on the other hand positive words like "it shall be lawful." 23. The observations in Lila Gupta's case are wide. They are undoubtedly made in the context of the proviso to section 15 of the Hindu Marriage (Amendment) Act, 19768, since deleted. The proviso opened with the prohibition that "it shall not be lawful." This Court considered the question whether a marriage contracted in violation of the proviso would be a nullity or void and came to the conclusion that though the proviso is couched in prohibitory and negative language, in the absence of an express provision it was not possible to infer nullity in respect of a marriage contracted by a person under incapacity prescribed by the proviso. 24. In any event, in the present case we are satisfied that the Appellant's marriage was not subsisting when he married again. He had filed an application for withdrawal of his appeal against the decree for dissolution and had done nothing to contradict his intention to accept the decree of dissolution. You can seek the help of lawyers in India for more details. 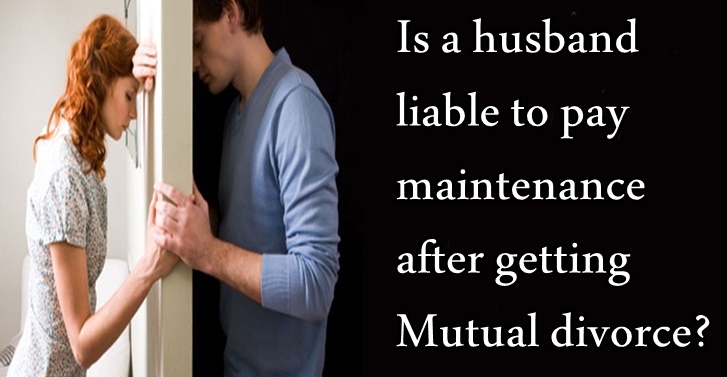 Click on the image to read more about IS A HUSBAND LIABLE TO PAY MAINTENANCE AFTER GETTING MUTUAL DIVORCE?